The city of Salzburg, Austria, is located close to the border with Southern Germany. 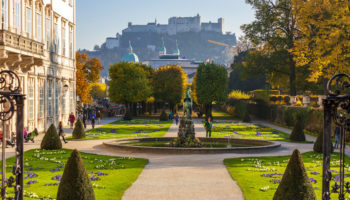 Salzburg is perhaps best known for its musical ties, since it is the birthplace of Mozart as well as the backdrop for the iconic film The Sound of Music. The Austrian city is also home to stunning architecture, which includes the castle called Schloss Hellbrunn and the impressive Hohensalzburg Castle. In order to fully appreciate the Austrian culture, scenery and history, try to add a few of these day trips from Salzburg to your itinerary. A 45-minute drive west of Salzburg will bring you across the German border, into Bavaria and straight to the lake known as Chiemsee. Within the lake itself are three major islands, one of which is called Herreninsel. On this island, you’ll find a complex of royal structures known collectively as Herrenchiemsee. These buildings were built under the orders of King Ludwig II, and they are among the most important architectural features in Bavaria. You won’t want to miss a tour of the Neues Schloss, which was modeled after the Palace of Versailles in France. 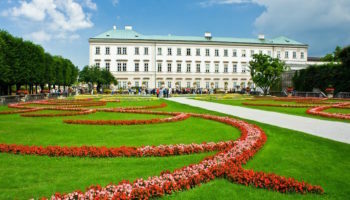 Surrounding the castle there are beautiful gardens as well as an impressive sculpture collection. To get to Herrenchiemsee by public transport, you first want to take the train from Salzburg to Prien am Chiemsee railway station. Once you arrive, take a wonderful 15-minute boat trip to Herrenchiemsee itself. All in all, the journey should take you around an hour and 15 minutes. Driving to Herrenchiemsee is just as easy and saves you around 15 minutes journey time, although it may take you some time to find a parking space in Prien am Chiemsee. From Salzburg, take bundesautobahn 1 until the German border, where you then continue on the 8 until you get to Lake Chiemsee. After parking, you again need to hop on a boat which will take you to the glorious Herrenchiemsee. Zell am See is a popular health and tourism resort located south of Salzburg. The biggest attraction is the lake, which the entire town is built around. The waters of the lake come from the surrounding glaciers, and snow-capped mountains create a stunning visual backdrop. You may want to visit Zell am See if you’re into outdoor sports, because recreation is a big part of the location’s appeal. In the summer, boating, cycling and hiking are common, and in the winter people head to the nearby Schmittenhöhe for skiing. As direct trains run quite frequently from Zell am See, it is very easy to get from one to the other. The journey usually takes between 90-120 minutes. On the way, you’ll pass through some spellbindingly beautiful scenery, and once you arrive, everything is within walking distance. By car, the journey to Zell am See takes about an hour and a half, although you may find yourself frequently stopping to take pictures of the lovely mountains you pass by. 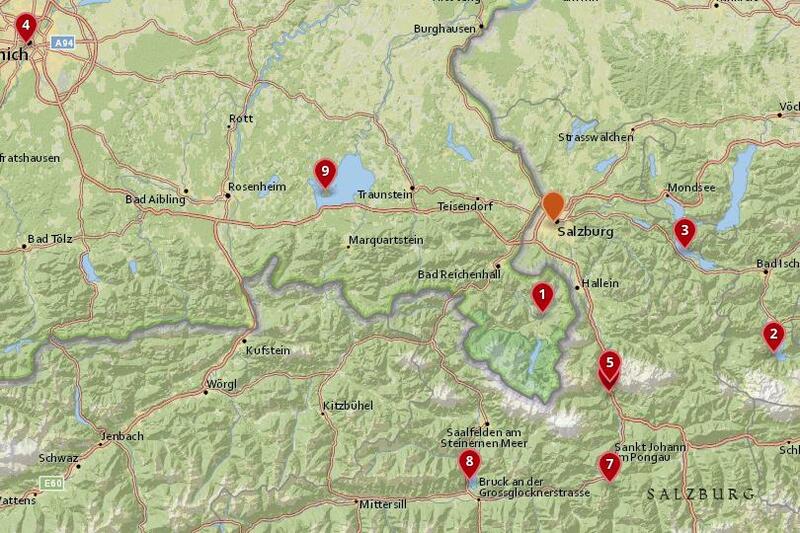 From the center of Salzburg, take bundesautobahn 1 west to the border with Germany. Once you cross over, follow bundesstrasse 21 until you find yourself back at the Austrian border on the other side of Berchtesgaden National Park. After continuing along 178 for a while, turn off onto the 311; this will take you all the way to Zell am See. One of the most breathtaking natural attractions in Austria is Liechtensteinklamm. Located 70 km (45 miles) south of Salzburg, Liechtensteinklamm is an extensive gorge, or ravine, with tall, high sides. Waterfalls and flowing water eroded the gorge into what it is today, and you can walk right through it along a series of paths and bridges. As you walk, you’ll hear the roaring sound of water rushing through the gorge, you’ll see waterfalls and you’ll be able to admire the lush greenery thanks to constant precipitation. A visit to Liechtensteinklamm can truly feel like an otherworldly experience you won’t ever forget. By public transport, it is straightforward to get to Liechtensteinklamm, although you will have to take a train and then a bus. First of all, hop on a direct train from Salzburg Hbf to St. Johann im Pongau station. These run very frequently, and the journey takes around an hour. From the station, take bus 540 for the last ten-minute stretch of the trip. Once you get off at St. Johann im Pongau Steglehen stop, you’ll see signs telling you where to go. For this last stretch, you could also take a taxi if it is more convenient. 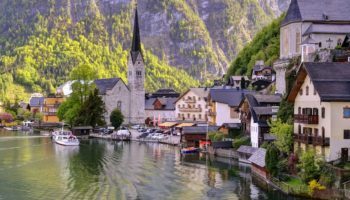 Another option is to drive there; this then means you can stop off at incredible sights such as Hohenwerfen Castle, Eisriesenwelt Cave, and Salzwelten salt mine on your way back to Salzburg. To get to Liechtensteinklamm, merely loop around Salzburg city center on bundesautobahn 1 until you get to the 10, then follow this south until Elmauthal. Here, continue on bundesstrasse 311. Around St. Johann im Pongau, you’ll see signs pointing you to Liechtensteinklamm. Above the city of Werfen, located just 40 minutes south of Salzburg, stands a majestic castle and fortress. Hohenwerfen, which literally means “Above Werfen”, was constructed in the 11th century. Surrounded by the beautiful Berchtesgaden Alps as well as the Tennengebirge Mountains, Hohenwerfen looks like something out of a fairy tale. The history of the castle includes many wars and even a brief stint serving as a prison, but today the structure is primarily a museum. If you visit, you can view many of the refurbished rooms as well as interesting features like the weapons collection and the falconry, which boasts a number of beautiful birds of prey. Overlooking the city of Werfen, Hohenwerfen Castle couldn’t be simpler to visit from Salzburg. Just hop on a train at Salzburg Hbf and alight at Werfen railway station around 45 minutes later. From here, you can either hike a scenic pathway up to the castle or take a short taxi ride. While in Werfen, it is well worth visiting the impressive Eisriesenwelt Cave at the same time, as it lies nearby. It is also very easy to drive to the castle from Salzburg. Just jump on bundesstrasse 150 heading south out of the city center. Once you come to bundesautobahn 10, simply follow it to Werfen, where you’ll see signs pointing you to the castle’s car park. While you’re in the area, make sure to check out the delightful Liechtensteinklamm, which is just 15 minutes from Werfen. Or stop by the world’s oldest salt mine at Hallein on the way back to Salzburg. Also in the town of Werfen are the Eisriesenwelt Ice Caves. These are naturally formed ice and limestone caves in the Hochkogel Mountain. Eisriesenwelt, which translates into English as World of the Ice Giants, is considered to be the largest ice cave in the entire world. The cave is only open from May to October each year, but don’t let the summer climate aboveground fool you. In the cave, temperatures are often below freezing. 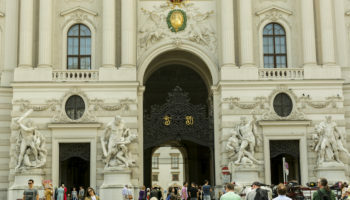 Some of the top attractions on a tour of the cave include Alexander von Mörk Cathedral, which is the largest room in the cave, and the enormous stalactite called Posselt Tower. By public transport, Eisriesenwelt Cave is very easy to get to from Salzburg; direct trains run regularly to Werfen – the nearest railway station. From Salzburg Hbf, it takes about 45 minutes to get there. Once you arrive, you’ll find shuttle buses that will take you to the spectacular cave in no time at all. Once you’ve visited the caves, make sure to check out the fantastic Hohenwerfen Castle before taking the train back to Salzburg. It is just as easy to drive to Eisriesenwelt Cave from Salzburg, although you will have to pay some tolls if you want to take the quickest route. Head south out of the city on bundesstrasse 150. Once you get to Neu-Anif, turn onto bundesautobahn 10 and follow it south until you see signs for the caves around Werfen. All in all, it takes about an hour. With a car, you can easily visit Hohenwerfen Castle or the nearby Liechtensteinklamm, which lies just 15 minutes south of Werfen. 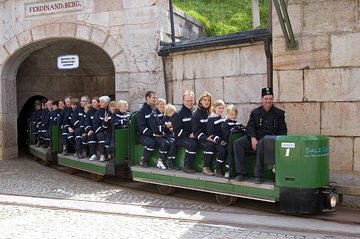 A great way to see the Eisriesenwelt Cave is to take a guided tour. Not only will you get to see all of its amazing sights and learn about its fascinating history, but you’ll also get to visit the beautiful Golling Waterfalls and the spectacular Salzwelten – the oldest salt mines in the world. See trip reviews & prices. 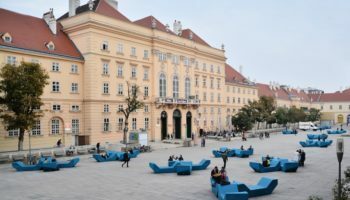 Direct train links connect Salzburg and Munich, making the Bavarian capital a great day trip destination for visitors. Munich is an incredible city with lots to see. In the city center, or Altstadt, you will definitely want to check out the New City Hall built on the Marienplatz. Listen for the sounds of the Glockenspiel, which goes off regularly all day. There are dozens of museums to explore in Munich, so pick the subject that appeals to you most: BMW cars, antiques, Bavarian history and so much more. Even if you’re not in Munich during Oktoberfest, join the crowds of tourists at beer halls like Hofbräuhaus for a pint. To get to Munich by train from Salzburg usually takes between an hour and a half to two hours, and trains run very regularly. While some are direct trains to Munchen Central Station, others stop at Munchen Ost, from which you can take a short metro journey into the center. Although a lot of the trains are direct, with some, you need to change trains at Rosenheim, so make sure to check before buying your tickets. Driving takes roughly the same amount of time, depending on traffic and whether you take toll roads. From the center of Salzburg, head southwest out of the city on A1 and follow it across the border into Germany. Here, it turns into bundesautobahn 8. All you need to do is follow it directly to Munich. If you have time on the way back, stop off at the wonderful Chiemsee Lake to see the beautiful royal palace there. 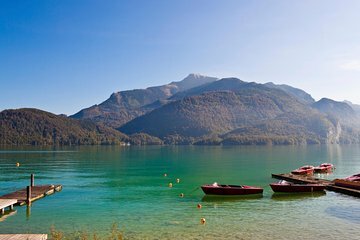 Less than 30 km (20 miles) east of Salzburg is Wolfgangsee, a lake in the resort region known as Salzkammergut. On the banks of the Wolfgangsee, there are lots of charming restaurants and small towns with a rich, historic appeal. One such town, St. Gilgen, boasts so-called “chocolate box houses” with visible exterior timbers and a classic Austrian style. The Wolfgangsee is a place for outdoor adventure, and pastimes like hiking and boating are a big draw to the area. Don’t leave without trying the local culinary specialty, Steckerlfisch, which is a local fish grilled on a skewer over an open flame. By public transport, it only takes an hour and a half to get to Sankt Wolfgang. Just hop on bus 150 from Salzburg Hbf and get off at Strobl Busbahnhof, where you’ll then need to take bus 546 for the last 15 minutes of the journey. Another option is to take bus 150 again, but instead, get off at St. Gilgen at one end of the Wolfgangsee. You can then take a lovely ferry ride to Sankt Wolfgang. Driving to Wolfgangsee is also very easy. This then means that you can explore some of the other lovely lakeside towns that lie nearby. To St. Gilgen, for instance, only takes half-an-hour; all you have to do is stick to bundesstrasse 158, which will take you all the way there from Salzburg. 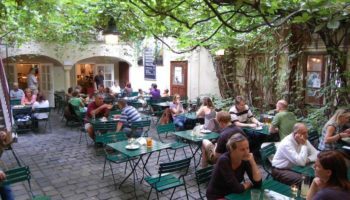 From here, you could then drive to the nearby Sankt Wolfgang, Hallstatt, or Bad Ischl – all of which are lovely to visit. To fit as much into their day at the Wolfgangsee as possible, lots of people decide to take a sightseeing tour to Austria’s Lake District. As well as exploring both St. Gilgen and Sankt Wolfgang, tours include a scenic boat ride on the lake and a trip to Castle Fuschl. See trip reviews & prices. Southeast of Salzburg is Hallstatt, a small town that overlooks the gorgeous blue waters of Lake Hallstatt. The history of this town dates back for more than 4,000 years, with the region being used primarily because of its available salt mines. Today, most visitors arrive for the picturesque views and the charming town itself. During the summer, cars aren’t allowed in Hallstatt, making it a completely pedestrian-friendly spot to explore on foot. You can tour the original salt mines, if you wish, or you could explore a very unusual attraction called the Beinhaus. The Beinhaus, or Bone House, is where the stacked bones of previous residents are dried and stacked because of limited burial space in the town. 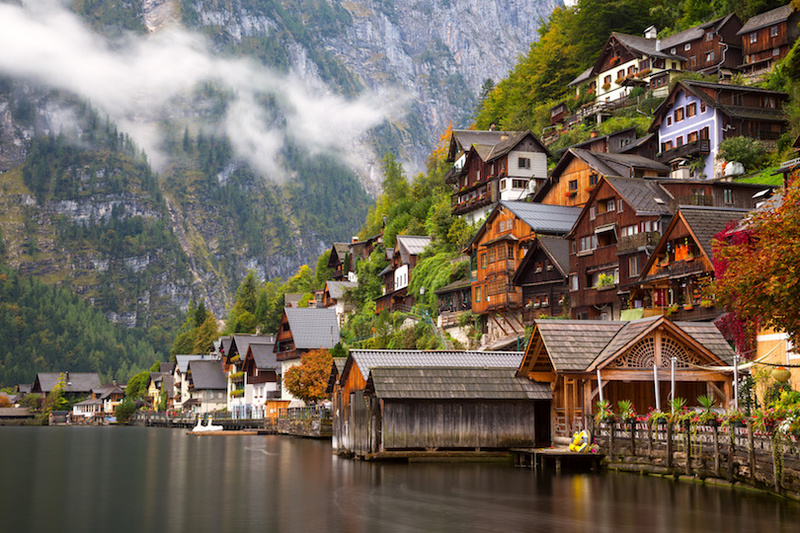 Hallstatt is about two and a half hours away by public transport. The scenery you pass through on the way there and back is absolutely stunning. From Salzburg Hbf, you first want to take bus 150 to Bad Ischl, where you then take bus 542 or a train to Hallstatt station. After that, you still have one more leg of the journey to complete: a beautiful ferry ride across the lake to the town itself. A slightly longer route which is a bit more comfortable is to take the train from Salzburg to Hallstatt. You will, however, have to get off and change around half-way there at Attnang-Puchheim station. This option still includes a ferry ride from Hallstatt stop to the charming lakeside town. By car, it only takes an hour and 15 minutes to get to Hallstatt from Salzburg. You will pass by glorious, glimmering lakes and towering mountains. Just head east out of the city center on bundesstrasse 158 and follow it all the way to Bad Ischl. From here, hop on the 145. After Bad Goisern, all you need to do is follow signs directing you to Hallstatt. On the way back to Salzburg, make sure to stop by the beautiful Wolfgangsee to explore the charming town of St. Gilgen. Another option for visiting Hallstatt is to take a guided tour to the scenic little town. This also includes a stop at the impressive Muhlbach Waterfall and the chilling but fascinating Hallstatt Bone House. In addition to this, guests have the chance to explore the town at their leisure and take a cable car up to a fantastic viewpoint. See trip reviews & prices. Just over the German border, is Berchtesgaden. This charming, postcard-perfect town is beautiful in its own right, and its backdrop is made up of stunning mountain peaks and salt mines. These salt grottoes look like they are made from diamonds, not to mention the surreal subterranean lake. 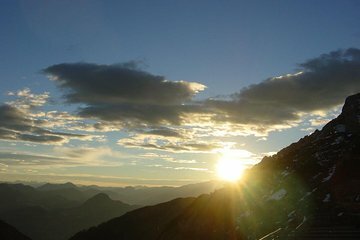 However, what makes Berchtesgaden so popular is that it houses the Eagle’s Nest, or Kehlsteinhaus. From this vantage point, you can admire spectacular vistas, and it was created as a gift for Adolf Hitler. Even after the end of World War II, Kehlsteinhaus was preserved. It is, today, a poignant reminder of the past. By public transport, it is very easy to get from the center of Salzburg to the stunning Berchtesgaden just over the border in Germany. Simply hop on bus 840 from Salzburg Hbf, and you’ll find yourself in Berchtesgaden roughly 50 minutes later after having passed through some lovely scenery. Once you alight, you’ll find all the town’s sights are within walking distance, although you will need to take a short bus ride on the 838 if you want to visit the Eagle’s Nest. It is even quicker to drive to Berchtesgaden yourself. This affords you the opportunity to explore the surrounding countryside at your leisure. From Salzburg, head south out of the city center on bundesstrasse 150 and merely follow it over the border into Germany. Here, it turns into the 305 – that will take you directly to Berchtesgaden. As it only takes 30 minutes to get there, you can always continue further into Berchtesgaden National Park if you want to explore more of the pristine alpine scenery. Alternatively, you could stop by Hellbrunn Castle on the way back to Salzburg. 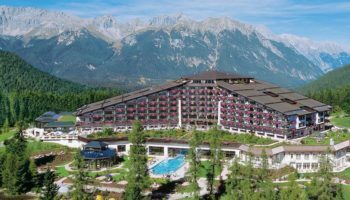 To make the most of their time in Berchtesgaden, many people opt to take a guided tour to the famous Eagle’s Nest, which offers up breathtaking views of the surrounding mountains. After learning about its interesting history from your guide, you’ll have free time to explore the picturesque Berchtesgaden before embarking on the scenic coach ride home. See trip reviews & prices.